Scottish by birth, Gordon was brought up in Stratford-upon-Avon, England, from the age of five. With an injury prematurely putting an end to any hopes of a promising career in football, he went back to college to complete a course in hotel management. Ramsay’s first years in the kitchen were spent training under culinary luminaries such as Marco Pierre White and Albert Roux in London, after which he moved to France where he worked in the kitchens of Guy Savoy and Joël Robuchon for three years where he was able to enhance his expertise in classic French cooking. In 1993, Gordon became chef of the newly opened Aubergine, within three years the restaurant was awarded two Michelin stars. Gordon's first book, Passion for Flavour, was published in 1996. Since then a number of hugely successful books by Gordon have been published. His most recent recipe book, Gordon Ramsay’s World Kitchen was published by Quadrille in November 2009. 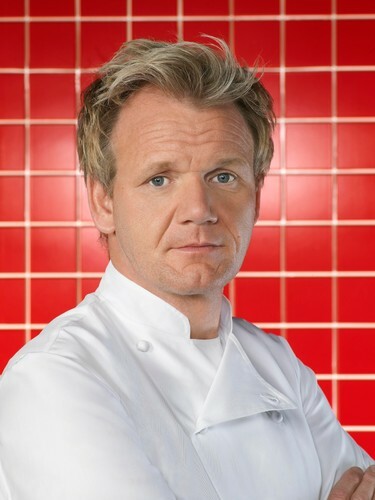 In 1998 at the age of 31, Gordon set up his first wholly owned restaurant, Gordon Ramsay, in Chelsea. On 19th January 2001 it won its third Michelin star. In October 2001 Gordon opened Gordon Ramsay at Claridge's which won a Michelin star in 2003. The same year saw the opening of Gordon Ramsay Holdings first international restaurant, Verre, located in the Dubai Hilton Creek Hotel. A year later he opened in St. James's. Within seven months it had won a Michelin star. The restaurant relocated to The Berkeley Hotel in 2003 and won its second Michelin star in January 2007. At the beginning of October 2002, Gordon Ramsay Holdings took over the food and beverage operation at The Connaught Hotel with Angela Hartnett at the helm. Her restaurant MENU won its first Michelin star in January 2004. In 2003 Gordon Ramsay Holdings re-launched The Savoy Grill and the restaurant achieved its first Michelin star in 2004. This was followed with the opening of Boxwood Café with chef Stuart Gillies. May 2004 saw Gordon Ramsay star in the Channel 4 series Ramsay's Kitchen Nightmares, later to be awarded a BAFTA and an International Emmy. Shortly after this, Gordon was given two weeks to direct a group of celebrities towards Michelin standard cooking in the ITV series Hell's Kitchen. A second series of Ramsay's Kitchen Nightmares was followed by the debut of Channel 4's The F-Word, a high-octane food show with cooking, topical VT's, food campaigns and celebrity guests. In America, a sixth season of Hell’s Kitchen aired this summer to exceptional viewing figures of over 14 million. 2005 also saw the launch of GRH’s eighth UK restaurant, maze, in London's Grosvenor Square with Jason Atherton and the opening of Gordon Ramsay at The Conrad Hotel in Tokyo. The year was rounded off with Gordon's award of an OBE in the New Year's Honours list. In November 2006 Gordon made his stateside debut with the opening ofGordon Ramsay at The London in The London NYC Hotel, part of the LXR Luxury Resorts collection where Josh Emett, previously head chef at The Savoy Grill is the resident chef de cuisine. In January 2007 Gordon Ramsay Holdings opened Cielo at the exclusive Boca Raton resort in Florida. 2007 was also the year that Gordon opened his first pub, The Narrow, in a Grade II listed building on the banks of the River Thames in London’s Limehouse. Gordon has since gone on to open two further pubs: The Devonshire in West London and The Warrington in Maida Vale. The fifth international Gordon Ramsay restaurant opened towards the end of the year at the Ritz Carlton Hotel Powerscourt, Ireland. January 2008 saw the re-opening of Chelsea’s classic neighbourhood bistro, Foxtrot Oscar, on Royal Hospital Road, just a few doors away from Gordon’s eponymous restaurant. In early 2008 Gordon Ramsay Holdings and Lyndy Redding announced their acquisition of the acclaimed Tante Marie Cookery School which re launched in September the same year. In March Gordon introduced his first restaurant in France at the legendary Trianon Palace & Spa located just steps away from the famed Château de Versailles. March was also the month that Gordon, together with Stuart Gillies, opened Gordon Ramsay Plane Food, a restaurant at the newly built Heathrow Terminal 5. This was followed in April by the launch of maze Grill in London’s Grosvenor Square and the publication of maze executive chef Jason Atherton’s first recipe book, maze, The Cookbook. In June Gordon launched Gordon Ramsay at The London in West Hollywood. August saw the launch of Gordon Ramsay protégé Angela Hartnett’s fine-dining restaurant, Murano in the heart of London’s Mayfair which was awarded a star in the 2009 Michelin Guide. At the end of September, York & Albany, located on the edge of London’s Regents Park, opened comprising of a restaurant with bar, delicatessen and guest accommodation. April 2009 saw the launch of maze by Gordon Ramsay at The One&Only Cape Town. Modelled on its British namesake, the menu evokes the bountiful flavours of authentic South African recipes. At the beginning of July, Gordon Ramsay Holdings opened Gordon Ramsay at Forte Village, at the exclusive and luxurious resort in Sardinia. This was closely followed by the launch of Contrada at Castel Monastero in Tuscany in August. 2010 is set to be an exciting year and will see the re-launch of Pétrus in the heart of Belgravia and The Savoy Grill at the iconic London hotel. 2010 will also see the groups first launch in Australia. maze, taking influence from its British namesake, will open in the spring at Crown’s newest acquisition in the city.